The Harley-Davidson LiveWire, launching in August, is the American manufacturer's first electric motorcycle. Harley-Davidsons are famous for their iconic deep rumble. But the Milwaukee-based motorcycle maker's latest model features an electric motor that emits a high-pitched whirring sound. Will Harley fans go along for the ride? After five years of tweaking and preparation, Harley-Davidson's long-awaited electric motorcycle will start rolling out to dealerships this summer. The company says electric bikes are the future. A number of startups are already marketing electric motorcycles, and Harley doesn't want to be left in the dust. It wants to attract new customers, and it's eyeing growth in urban centers — and eventually in overseas markets, including Asia, where electric scooters and motorcycles are popular. The LiveWire, the electric bike debuting in August, is sporty and quick — a street bike built for urban environments, not for long-haul cruising. It can go some 110 miles on a charge, with instant acceleration and, in a boon for first-time riders, no gear-shifting to worry about. But it's a marked departure from the company's traditional lineup, and it comes with a hefty price tag: $30,000. Marc McAllister, the vice president of product planning and portfolio at Harley-Davidson, says the response to the LiveWire has been "overwhelmingly positive." There's nothing incongruous about an electric Harley-Davidson, he says. "After 115 years we've had to reinvent ourselves a number of times, and this is just the the next step in continuing the legacy," he says. But while there's plenty of buzz around the bike, some riders are skeptical, says Kelley O'Brien, the marketing manager for two Harley-Davidson dealerships, including one in Washington, D.C.
"You have that demographic that have been a Harley rider for 30 years," she says. "They don't like it. They don't like the sound — it's not the same sound." "But it has a unique sound," she says. "It's still a Harley-Davidson ... Be open-minded about it." Harley has faced a challenging few years. Baby boomers are aging out of the motorcycle market, and millennials aren't replacing them. In 2014, the company shipped about 271,000 motorcycles worldwide, says analyst Jaime Katz of Morningstar. In 2019, it's expected to ship maybe 222,000 — "a pretty nice downswing over the last five years," she says. To appeal to younger buyers, Harley is offering smaller, cheaper bikes — but it makes less of a profit on each of those, Katz says. Meanwhile, trade wars have been putting fresh pressures on the company. The LiveWire isn't likely to be a game changer for the company, Katz says — at least, not anytime soon. It's just too expensive. "The overall target market for $30,000 bikes, whether it's electric or traditional, is not significant," she says. The LiveWire is one of Harley's most expensive offerings. Only the priciest trikes — three-wheeled motorcycles — and custom touring bikes cost more. Meanwhile, many entry-level bikes are available for less than $10,000. Electric models from Zero — probably the best-known producer of electric motorcycles to date — range from $8,500 to $16,000, while other electric motorcycle start-ups are promising even cheaper prices. Harley enthusiasts at a Washington, D.C., motorcycle show illustrate the challenge the company faces as it tries to market the LiveWire. Mike Anderson, of Alexandria, Va., is wearing a vest with a profusion of Harley Owners Group patches. He sprang for one of Harley's priciest bikes. But the LiveWire? "It's going to be a great bike," he says. "But to me, you know, I'm old-school. ... You buy a Harley because you like the sound and the look and the feel, and the LiveWire of course is 180 degrees opposite of that." "I'm not sure if it's going to catch on," he says. "I think it will attract the younger people — they call them, what, millennials or whatever? I think it will attract that group, other than 59-year-old farts like myself." Andrew Delgado, of Woodbridge Va., is 28 and doesn't have a motorcycle yet. He says an electric motorcycle sounds cool. But the price tag — "that's not cool," he says. "I do like the idea," he says. "Just not the price of it." He's browsing motorcycles with his young daughter, dreaming of buying one someday — for a third of the price of a LiveWire. An American classic, the Harley-Davidson motorcycle, is getting an eco-friendly makeover. 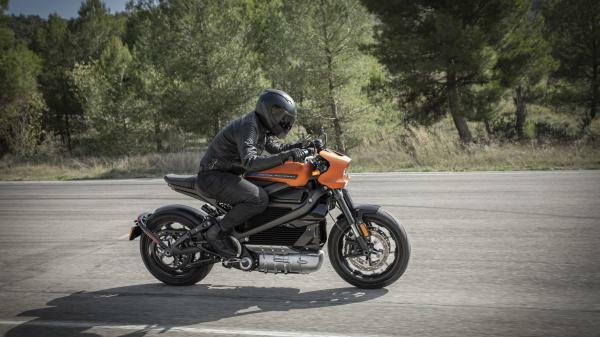 The first electric Harley is hitting the roads after years of development. But will riders go hog-wild for it? NPR's Camila Domonoske reports. CAMILA DOMONOSKE, BYLINE: A Harley-Davidson motorcycle has a familiar sound. DOMONOSKE: But the LiveWire, Harley's upcoming electric offering, sounds different. DOMONOSKE: Sound is essential on a motorcycle, and it's not just for the mystique. It's for safety so you can hear riders coming. But electric motors can be nearly silent, a problem Harley had to solve. Marc McAllister of Harley-Davidson wants you to know the LiveWire's sound is real. MARC MCALLISTER: The sound is a mechanical sound that comes from the operation of the vehicle, and it sounds like - when you're at highway speeds, it almost sounds like a jet engine. DOMONOSKE: Many companies believe electric is the future. As people pay more attention to climate change, Harley sees an opportunity especially with younger riders and in urban centers in Asian markets. A number of startups are already making electric motorcycles, but those companies don't have Harley's historic reputation to consider. McAllister says an electric Harley-Davidson is not a contradiction in terms. MCALLISTER: Because Harley-Davidson - after 115 years, we've had to reinvent ourselves a number of times, and this is just the next step. DOMONOSKE: But some people are skeptical. Kelley O'Brien is the marketing manager of a Washington, D.C., Harley dealership. She was working at the D.C. motorcycle show last weekend. KELLEY O'BRIEN: You know, that demographic that have been a Harley rider for 30 years and they're like - they don't like it. They don't like the sound. It's not the same sound. DOMONOSKE: Still, she says, the sound is unique, and the bike has gotten a lot of buzz. Preorders opened a few weeks ago. DAVID LUTZOW: I would love to sit on one, here one up close. DOMONOSKE: David Lutzow was a 59-year-old Air Force veteran and a proud Harley rider. He's heard the LiveWire is fast, and for the sake of the planet, he's glad Harley is making an electric bike. LUTZOW: I mean, ultimately for the ecosystem and stuff, I think it's going to be good. A lot of things are going electric. LUTZOW: I'm sorry. I'll still take my big tour bike. If they can make a big tour bike electric, then, you know, maybe I'll think about it. DOMONOSKE: The LiveWire is not a big tour bike. It's a smaller street bike, more sporty. LUTZOW: I think it will attract what - I guess the younger people. They call them - what? - millennials or whatever. But I don't know - not - maybe not initially old guys like me. DOMONOSKE: So how about those millennials? Andrew Delgado is 28. He doesn't own a bike, but he'd like to. He's admiring the Harleys on display at the show. LUTZOW: I've just wanted one since I was a kid - freedom and being able to carve up a road. DOMONOSKE: He's exactly the target audience Harley would like to reach as they look to expand their ridership. And he thinks an electric motorcycle is cool, but then he finds out it costs $30,000. ANDREW DELGADO: That's not cool (laughter). I do like the idea of it but just not the price of it. DOMONOSKE: He'd be looking to spend less than $10,000, and there are plenty of options at that price. Thirty-thousand is a lot. Jaime Katz is an analyst with Morningstar. JAIME KATZ: The overall target market for $30,000 dollar bikes, whether it's electric or, you know, traditional, is not significant. DOMONOSKE: And it's especially out of reach for younger people. As a result, she's not predicting huge sales numbers. KATZ: We don't think this is going to really sway the profit potential for the business in any significant way. DOMONOSKE: Not yet, anyway, although future, cheaper electric bikes might be a different story. Camila Domonoske, NPR News. Transcript provided by NPR, Copyright NPR.